What if I told you didn't need two grown men to haul around a giant slab of wood, drywall, metal, etc? The GORILLA GRIPPER is unique divice that allows you to carry around the giant and heavy panels of material all by yourself. The Gorilla Gripper slips onto the top edge of any panel of material, clamps down, and offers a handy carrying handle that lets you easily haul it around to your side. The gripper clamps down onto the top of the panel which creates an extremely sturdy and temporary handle for someone to carry it. The device will continue to grip the panel until you lower it to the ground, which is when it releases its grip. A perfect gift idea for Dad, a carpenter, drywall installer, general handyman, and more, the Gorilla Gripper works great both on the job site and while just picking up the slabs of material at the store. No more splinters and hurt backs! 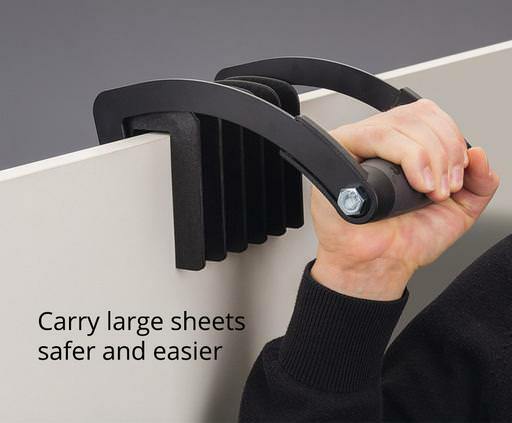 Not only great for wood panels, the Gorilla Gripper also works with drywall, metal sheets, glass panels, particle board, melamine, large signs and a ton of other types of materials that are just too awkwardly shaped or too long to carry by just one person. It reduces the risk of strain and injury to your back, shoulders, neck, arms, and hands while hauling around these heavy loads. The Gorilla Gripper is made from epoxy coated steel support arms, along with extremely durable glass-filled nylon polymer gripper plates. The device has a continuously self-adjusting clamp so you don't have to set a certain width each time, and is rated to carry up to 100 lbs of weight. Product material: nylon + iroN.